* Inside Email * by Christian Schmitz Have you ever needed to send email from inside your application? In this guide, you'll learn how to do it. * Smart Reporting * by Trisha Duke Sometimes a custom-made reporting solution is the answer. Trisha shares her method. * Xojo Around the World * by Markus Winter There are Xojo users everywhere. Markus even found some in New Zealand! 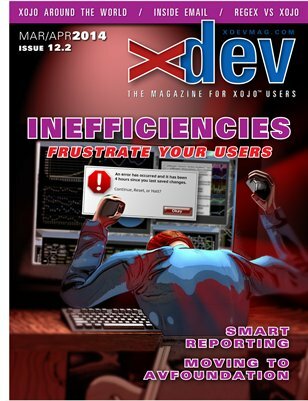 * The Dangers of Inefficiency * by Marc Zeedar An efficient application isn't just about code optimization -- you need to consider subtle ways in which you carelessly waste your user's valuable time. * Moving to AVFoundation * by Christian Schmitz If you haven't heard the news, QuickTime is dead. AVFoundation is the new way to manipulate video content in your programs. Christian explains the differences.